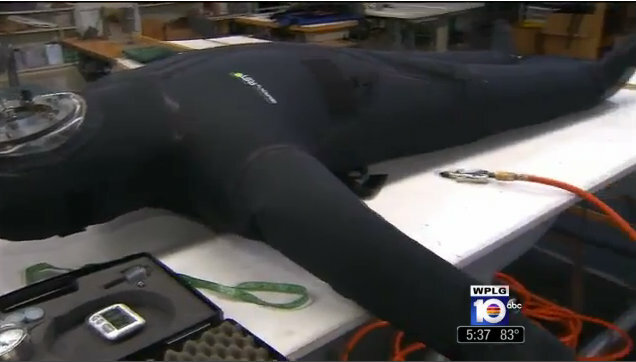 A Coral Gables company makes the world's only suit that protects the wearer against biological and chemical weapons. Dr. Ronald Demeo is the CEO of Radiation Shield Technologies, the company behind Demron. It's the only suit that protects against heat, radiation, biological, and chemical threats. "We know we are protecting lives, so it makes us all feel really good about what we do everyday," said Demeo. The material is tested for radiation and that there are no leaks. Demeo said the demand for the protective gear has doubled in the last few weeks. "We are a multi-threat protective apparel," Demeo said. "A soldier and first responder can do their job without any incumbency. It depends on the area of threat. Two years ago, it was Japan when it was Fukushima." While the company can't export to Syria, Demeo said they are now getting calls from Pakistan and Turkey. Each radiation suit costs $2,000. June-18-2011 | Demron Anti-Radiation Suits Donated to Japan -- American Technology at Its Best!